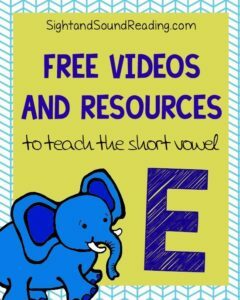 Here are the worksheets that teach the short e and long e sounds. (There is a small fee for this to help keep our site running. We hope someday we can offer everything for free -but…right now – we need to help the site pay for itself.) You can purchase a bundle with all the vowels here. You can also find a free copy of the long and short a worksheets here). Regardless of if you choose to purchase worksheets or not, the videos are here for you to help your children learn to read! We have two different types of worksheets within our phonics workbook. All of the worksheets have words to sound out with your children, and for the children to write as they sound out each word. Some of the worksheets have a sentence at the bottom, whereas others just have words to sound out. Mrs. Karle always wrote sentences with her students to teach them the proper technique when writing a sentence: Starts with a capital letter, and ends with a period, or question mark, etc. Additionally, the sentences use many different sight words, and they help the students learn to read/write/spell tricky words. We also have worksheets with words that the students can trace to further help the child learn to read, write and spell. The worksheets that do not have the sentences included are intended to go a little bit more in depth to help the struggling reader/writer/speller. We have an additional page with the sentence included so that these struggling readers also learn about sentences and sight words. If you get through the first few pages and your child really understands reading, writing and spelling this phonics skill, – then you may not want to do the last few pages of the short ‘a’ sound. If, however, you feel your child needs more practice -then, we made extra videos and worksheets that take things more slowly to really help a struggling student. I had a struggling reader, and these videos have helped TREMENDOUSLY to teach and guide her to sounding out words. However you use these worksheets and videos, Mrs. Karle encourages you to either chorally in a classroom of children, or, one on one with a child, sound out each word and write each word with the child, showing them what to do and say. She found so much success with struggling (and non-struggling) readers because she was slow, repetitive, and guided them every step of the way. So….here you have it – Mrs. Karle teaching the short ‘e’ sound. Here Mrs. Karle teaches the short ‘e’ words bed, red, men and and ten. She also teaches a sentence. This worksheet was meant to help all students learning phonics, and also to help with sentence structure, capitalization and punctuation. Here Mrs. Karle teaches the words hen, bell, get, and yes. She also teaches a sentence. In this video, Mrs. Karle teaches the words leg, eggs, went and when. She also teaches a sentence. These videos and worksheets were meant as further practice to help the struggling learner. Here Mrs. Karle teaches the words bed, bell, hen, egg, get, red. In this video, Mrs. Karle uses words from the last video to help teach the students how to form a sentence correctly, and sound out all the words. Mrs. Karle teaches the words leg, nest, man, bread, yes, and went. This video would be good for any learner, as it does help children learn that ‘ea’ can make a short e sound. In this video Mrs. Karle teaches a sentence to go along with the previous video. This is to further help children in sounding out words, to practice handwriting, and to learn how to write sentences. In this video, Mrs. Karle teaches the words ten, head, seven, bell, then, and hello. This is another video that helps teach the children that ‘ea’ can make a short ‘e’ sound. In this video, Mrs. Karle teaches a sentence to go along with the previous video. This helps the children practice handwriting, learn sentence structure, and further practice sounding out words. Love the videos! My 1st grader struggles with spelling vowel patterns and she will like watching these. Thanks for sharing. Wow! So many resources. This is so terrific! Thanks for sharing with all of us!